Buy denim for men and women for less by taking advantage of discounted Seven for All Mankind gift cards. Enjoy instant savings every time you shop. Use the giftcard along with coupon promo codes. 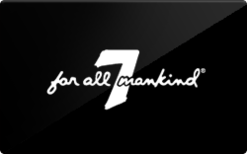 Buy 7 apparel for you or your loved ones by ordering online at 7forallmankind.com or at any participating 7 For All Mankind retail locations.